Off stage mutterings from Central Theatre Supplies: Do I REALLY need to Fireproof my scenery? Do I REALLY need to Fireproof my scenery? We orginally blogged about this 12 months ago - the idea for the initial post came about after we had a delivery of Firecheck (as the BBC say - there are other fireproofing solutions available - we just happen to stock this one) and one of the containers had leaked in transit. The supplier rang to check if we needed any more - end of term, summer fetes and pageants were coming up and they thought we might need to restock. We declined - we'd just ordered and whilst we sell Firecheck regularly, given that a lot of schools and colleges are preparing for shows - we don't seem to sell a lot. As fate seems to mostly take a hand in these things, we've had conversations with a handful of customers over the last week where this very topic has again cropped up. Rather than just eMail everyone with a link, we thought we'd follow the Hollywood trend and revisit the old post (though we don't have any CGI effects or handsome leading men to put their name to this). 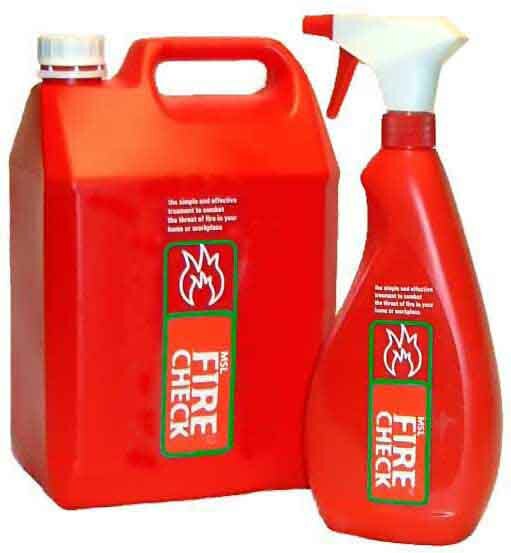 As you can see in the picture above, Firecheck comes in two styles of container - a handy pump bottle or a chunky container you can decant in to a garden spray bottle. So it's a no brainer isn't it - to keep a small container handy and as you make scenery - proof it? Of course - someone will be asking why? Well, we could start with - "You're responsible for the safety of the cast and audience for your show" - burning scenery doesn't fulfil that in all honesty. Anyway, do you really want to lose all your hard work and hours of labour because some lighting techie rigs a lantern too close to your handiwork and sets light to it? Having it fireproofed could mitigate the damage done perhaps by stopping fire spreading? Then there's the stage curtains and the auditorium window curtains - they're fireproofed too aren't they (or shouldn't we ask?) or did you have them reproofed when you last had them cleaned?